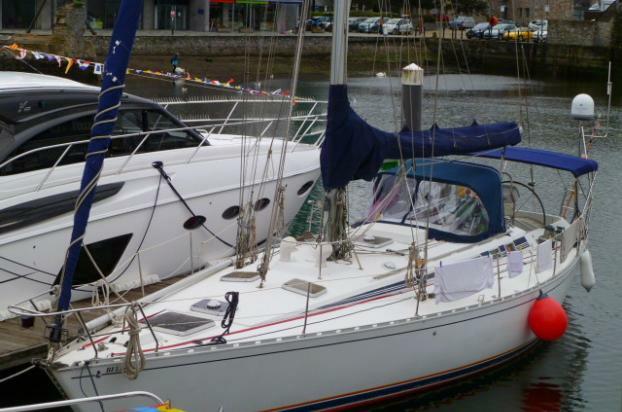 The Beneteau First Series from the mid 1980’s designed by German Frers were arguably some of the finest yachts built by Beneteau from this era. They were intended to compete directly with Nautor Swan's line of German Frers designed models. As such, they are fast, stiff and share many quality construction details and styling features with the Swans, not found in other Beneteau Series. With her Frers designed hull, and a powerful triple-spreader rig, she makes a fantastic fast cruising yacht! This example has been in the current ownership for nearly 10 years, and in that time they have cruised extensively between Norway and the western Mediterranean. Upgrades over recent years have included a new retractable bow thruster, an electric halyard winch, a new anchor windlass, a Garmin chart plotter/radar unit, and much more. Aluminium Alloy Mast, Boom & Spinnaker Pole. Tall masthead rig version with triple spreader mast, and running backstays for use in strong wind conditions. Engine major Top-End overhaul in 2016 including new injectors. 3 X Domestic batteries & 1 X Engine Start battery (All new in 2016), all batteries charged by engine driven alternator or shore battery charger. RCD and additional shore power sockets. Currently, the port aft cabin and heads are converted into additional storage adjoining the Galley Area. If additional berths are needed, this storage area could be easily converted back to a sleeping cabin and heads if required. Forward Cabin: Double berth offset to port. Dressing table and seat to starboard En-suite heads compartment forward with sea toilet (New March 2019) hand basin and shower. U Shaped seating area to port with centre-line table with drop leafs, settee berth opposite to starboard. Port side seating has been extended towards the centre-line to create a more comfortable wider seating base with a modified table leaf. Outboard, there are two generous pilot berths which are currently used as storage/book shelves and a convenient TV mounting, easily converted back if required. Cooker hood and filter system (New in 2015) 2 x top opening cool boxes with 12V / 240V fridge unit, cool box lids covered with durable stainless steel panels. 2 x stainless steel sinks with pumped fresh water. Adjoining storage area with chest freezer and 3 X 1m deep drawer storage unit. Chart Table: Located aft to starboard with a large chart space, upholstered seat and adjacent main electrical panel. 30" Samsung Flatscreen TV in saloon. WiFi Unit fitted with 2km range, external antenna with internal router, used for TV, e-mail, Skype etc.